After nearly a decade of patience that included monumental personal setbacks and attacks, Al Gore culminated his Year of Living Largely last week by winning the Nobel Peace Prize for his efforts to bring attention to the dangers of global climate change. The Nobel is the third major honor this year for the man George H.W. Bush once derisively referred to as "The Ozone Man" -- joining the Academy and Emmy awards garnered earlier in the year for his documentary film Earth in the Balance and his global television network Current TV. For many in the Nobel handicapping community, the former vice-president's win was a foregone conclusion, one that had been all but locked-up months before by both his new found standing in the liberal communities of the world and the endless amount of publicity his media ventures have produced over the past couple of years. While the bookmakers may have considered him a lock, there was surely one person who didn't think anything was over until the Fat Lady had actually sung -- Gore himself. 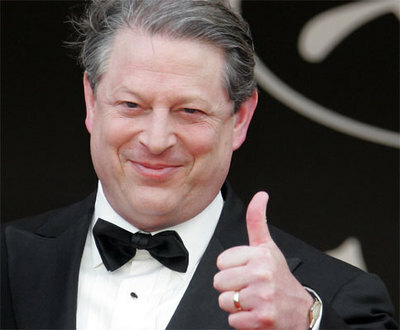 Although there is much to be said for positive thinking, no one could really have blamed Gore for being a bit cynical as the big announcement day approached -- winning the most votes in a presidential election but not winning the office will harden a guy. Watching the human train wreck appointed in your place squander eight years of hard-earned peace and surpluses can make you downright jaded. He had the rug pulled out from under him before, as so many of us did, when the networks pronounced him the winner in Florida on election night 2000 -- only to reverse the call later in the evening. But that was really only the beginning. As the night rolled on, the embarrassing loss of his home state of Tennessee furnished his opponent with a winning margin that Florida alone did not provide. The bitterly contested recount and non-recount in the Sunshine State produced perhaps his finest moment -- his patriotic and conciliatory concession statement that ended the five-week standoff, but the injustices kept coming. Right wing pundits continued to pillory him for everything from the contested election to the bogus mantra that he claimed to "invent" the Internet, or that he lied about the documented fact that parts of the book "Love Story" were based on his college days. By mid-2001, it appeared that Gore had lost his zeal for public life, and who could have blamed him? Within months of his concession speech, the former VP began taking hits from the left as well as the right. Everything from his campaign strategy and tactics to his honesty and weight came under scrutiny. Then something unexpected happened -- Al Gore found his voice. No longer forced to serve as Bill Clinton's straight man or the candidate of a party that never appreciated him, Gore returned to the primary topic of his early career -- our deteriorating environment. He didn't divorce himself from all other issues, even making a series of blistering attacks on the rush to war in Iraq, but it was global warming and his honest passion and obvious knowledge of the subject that made people stand up and take notice -- and take him seriously. The attacks began again last week, as Fox News Channel and the like commenced to equating the Nobel Committee with the editorial board of MoveOn.Org. On his HBO program Real Time, comedian Bill Maher anticipated the Bush Administration's reaction to Gore's win, quipping that Bush believes the award proves that "Sweden is with the terrorists." Meanwhile, the busload of current Democratic presidential hopefuls tried to be as complimentary as possible, without stating the obvious: Al Gore is the most qualified and accomplished candidate the party could possibly nominate in 2008. None of that matters today however. Al Gore is finally free of his past. He might want to do something really crazy -- like grow a beard or kiss his wife in public. Anything is possible when you're The Ozone Man. Scott Cavanagh is ediitor and publisher of Bark Back News. Column copyright 2007 Midland Avenue Communications. Reprints without permission are a violation of Federal Law.